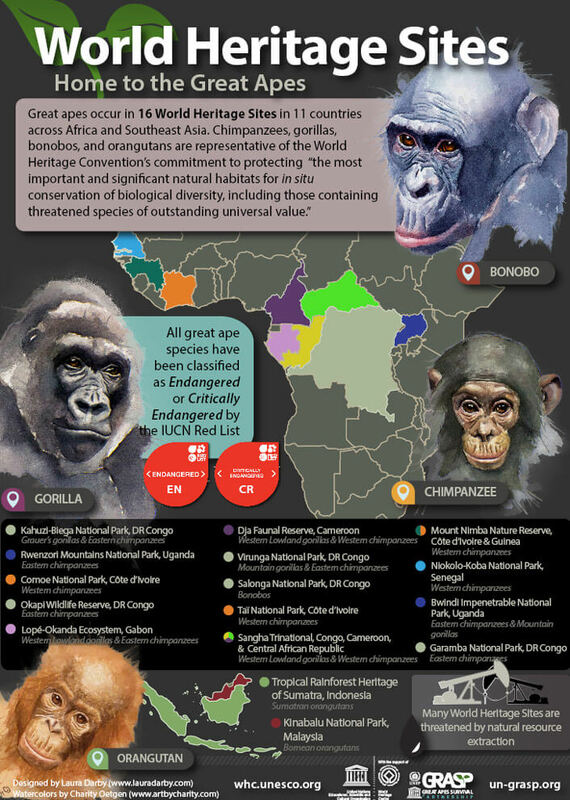 The endangered chimpanzees, gorillas, orangutans, and bonobos found at World Heritage sites in Africa and Asia underscore the importance of these forests and mountain ranges and are highlighted in an infographic released today by the Great Apes Survival Partnership (GRASP) and the World Heritage Centre of the United Nations Educational, Scientific and Cultural Organization (UNESCO). Great apes occur in 16 World Heritage sites, including the Virunga National Park in the Democratic Republic of Congo, the Taï National Park in Côte d’Ivoire, the Dja Faunal Reserve in Cameroon, and the Gunung Leuser National Park within the Tropical Rainforest Heritage of Sumatra in Indonesia, among others. Sadly, many of the World Heritage sites face extreme pressure from development and exploitation of natural resources. said Mr Kishore Rao, director of the UNESCO World Heritage Centre. World Heritage sites host some of the most fragile populations of great apes, including Mountain gorillas, Grauer’s gorillas, and Sumatran Orangutans, all of which are classified as critically endangered. The GRASP-World Heritage infographic features the artwork of American wildlife artist Charity Oetgen and was designed by GRASP programme associate Laura Darby in collaboration with UNESCO’s World Heritage Centre. The World Heritage Convention was adopted by UNESCO in 1972 to safeguard cultural and natural sites of outstanding universal value. A total of 1,007 forests, mountains, lakes, islands, deserts, monuments, buildings, cultural landscapes and cities are currently inscribed on UNESCO’s World Heritage List.Their state of conservation is monitored by the intergovernmental World Heritage Committee, which is in charge of implementing the World Heritage Convention. GRASP is a unique alliance of 98 national governments, conservation organizations, United Nations agencies, research institutions, and private companies, all committed to ensuring the long-term survival of great apes and their habitat in Africa and Asia.